10-07-2016 - (October 7, 2016) RENO, NV - SpineNevada Minimally Invasive Spine Institute, a center of excellence in Northern Nevada, has been named to Modern Healthcare’s Best Places to Work in Healthcare for 2016. The spine center was ranked #35 of 100 in the national recognition presented by Modern Healthcare. Further, SpineNevada was the #1 spine practice and the #1 practice in the small provider / insurer category (25-249 employees). For nine years, Modern Healthcare’s Best Places to Work in Healthcare recognition program has cast a spotlight on companies within the healthcare industry that cultivate a positive work environment. This focus on the internal customer experience fosters a similar positive experience for healthcare consumers. To view the complete list of Best Places to Work honorees, click here. The MH Best Places to Work program gathers information from employers and employees of companies with at least 25 employees. Employees complete surveys used to evaluate their employer in several areas to include leadership and planning, culture and communications, role satisfaction, working environment, relationships with supervisor, training and development, pay and benefits and overall employee satisfaction. “We share and celebrate this recognition with our staff because it is their extraordinary dedication to our mission and goals that create this positive culture and make success possible,” explains Dr. Lynch. In addition to this Best Places to Work honor from Modern Healthcare, SpineNevada has earned a number of other workplace awards including Becker’s Healthcare “150 Great Places to Work in Healthcare” and the Quantum Workplace Best Places to Work in Northern Nevada recognition. In other recent news, SpineNevada is excited about being one of the first in the country to offer Vertebral Motion Analysis (VMA). The advanced spine motion imaging offered by VMA provides more data than ever before by taking hundreds of x-ray type pictures of the spine. VMA provides more accurate motion measurements to help surgeons in diagnosing spine conditions and facilitates improved confidence in choosing the best approach to achieve ultimate relief of cervical or lumbar back pain. In addition to VMA, SpineNevada’s InMotion Diagnostics includes Open InMotion MRI (the weight-bearing and tiltable Esaote Brio), Digital X-rays and full body scoliosis imaging. The SpineNevada Radiology department is led by Dr. Stefan Franciosa, a dual board-certified Diagnostic and Interventional Radiologist. “With our comprehensive center, we are redefining spine care by offering more services — including diagnostics, radiology, physical therapy, injection therapy — under one roof. This saves patients time and speeds feedback to referring primary care providers,” Dr. Lynch explained. With office locations in Reno, Sparks and Carson City, SpineNevada is a regional center of excellence offering a comprehensive approach to spine care. The center includes fellowship-trained neurological surgeons; spine specialists board-certified in physical medicine, and radiology; and specialty-trained physical therapists, physical therapy clinics and InMotion Diagnostics. These spine experts take a conservative first approach and combine their expertise to develop the most appropriate treatment for each individual patient. 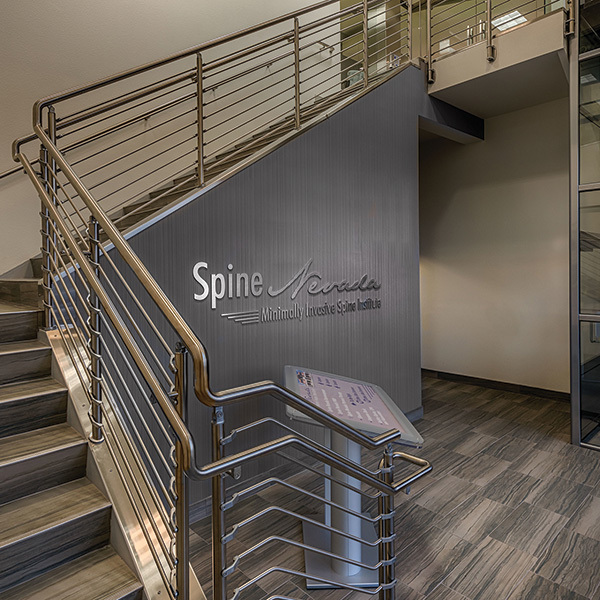 Founded by Dr. Lynch in 2004, SpineNevada’s goal is to be recognized as a regional spine center of excellence that demonstrates innovation in nonsurgical and surgical spine care, and then documents its superior care with clinical outcomes. The center’s mission is to help its patients return to active lives, through compassionate, evidence-based spine care, including non-surgical treatment options and the most technologically advanced minimally invasive surgical techniques.